Our friend Ty from Compete Sports Media dropped us a line to tell us about a very cool effort that they’re working on in Yotes land. 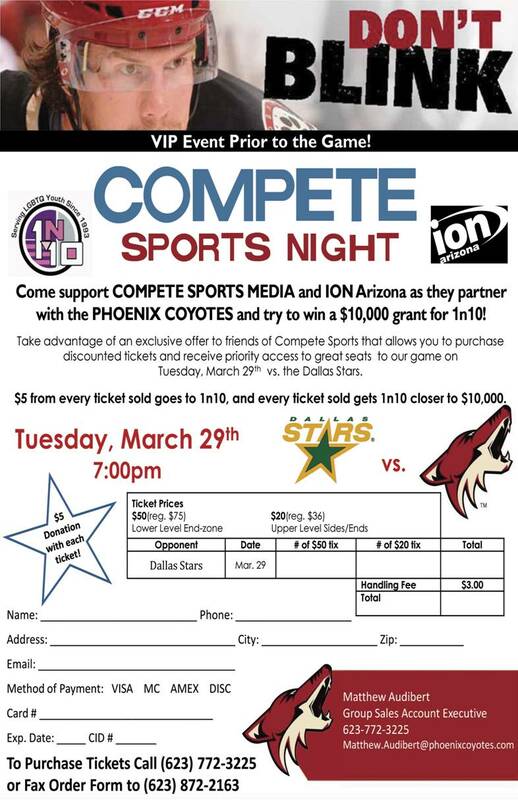 Tuesday night, March 29, as the Coyotes square off against their Pacific Division rivals, the Dallas Stars, jobing.com Arena will see its first Hockey Gay Night Out. This is something we’ve been talking about doing next season in partnership with our pals at Nellie’s Sports Bar. The Nats, Wizards and Mystics have seen similar affairs and have been very successful. Thousands turned out for Nats Night Out, we were told. A year out should provide us ample time to work with Caps Group Sales on securing a slew of tickets for a game late next season. The Yotes Night Out has all the makings of a fun evening and Ty also shared news on another such effort around the League – on Friday, March 11, the Columbus Blue Jackets hosted Pride Night. Our pal Pete Olsen of Wide Rights reports on the evening which featured the home team taking on the Kings. 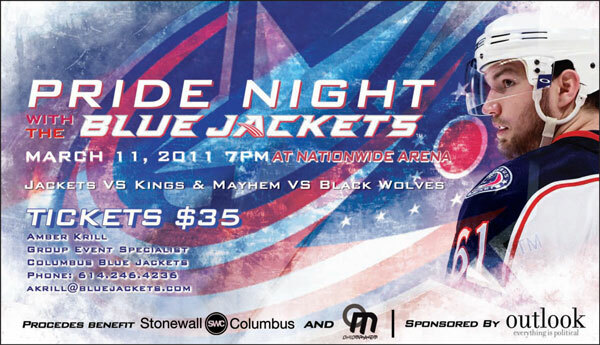 Also, two gay hockey teams faced off, the Ohio Mayhem and the Chicago Black Wolves. The hometown team dropped that game as well, but from the sounds of it, it was a great evening. We’ve been trying to get a handle on what other NHL markets have similar affairs, but don’t quite have the whole list yet. Something tells us the Bay Area and Sharks seem like a natural, and the Rangers may too, but the Garden hasn’t proved all that welcoming in the past. Maybe our pal Sean Avery has had an impact in the stands. We’ll find out. No matter; this is Hockey Capitol, and we will set the standard. Pink will give way to RED. Update: Sharks to host Gay Night Out game on Thursday, March 31.